Whatever you are selling first impressions make all the difference and in a car showroom first impressions are even more important than normal! When a potential customer walks into your premises one of the first things they will notice is the cleanliness of the showroom. 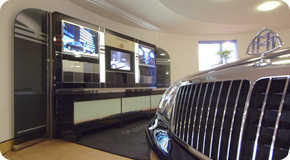 If your showroom is sparkling clean their attention will go straight to the cars, but if it is dirty, dusty and otherwise unclean it will soon distract from the cars that you are trying to sell, it may even raise questions as to whether the cars are maintained well if the showroom appears to be poorly maintained. For this reason it is very important that your showroom always looks at its best, Clean Genie offer a comprehensive cleaning service, aimed specifically at car showrooms. We ensure that all the large areas of glass frontage and high shine flooring found in Showrooms are all as clean and shiny as the cars, ensuring the only thing to notice in the showroom is the offers you have on! With Clean Genie taking care of your Contract Cleaning, you will have an edge over your competition as soon as the customer walks in the door! We provide our Car Dealership and Showroom cleaning services to individual dealerships or franchise networks throughout the UK.